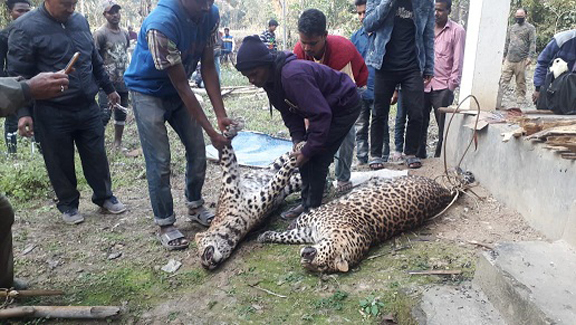 Sensation prevails following recovery of the carcasses of two male leopards inside a tea estate in Dibrugarh district on Thursday morning. Forest officials suspected that the leopards died due to a territorial fight between themselves. The carcasses lying alongside each other were discovered by the workers of Duttabagan tea estate situated near the Telpani reserve forest. Locals told forest officials that they heard the two big cats fighting at night. According to locals, on Wednesday night, the leopards ventured in the village area in search of food. The villagers said they had spotted a male leopard in their village a few days back. However, incidents of man-animal conflict have been reported from different parts of Assam. Experts say that due to shrinking of forest covers, the big cats come out from the forest in search of food and land in human territory which results in man-animal conflict. It may be mentioned that as many as five villagers, who have been identified as Sukra Munda, Kanu Mandal, Anita Das, Lahoti Lama and Tulsi Devi, who hail from North Sumdar village of Borhat under Sapekhati Police Station of Charaideo district were attacked by a full-grown leopard on Friday night. The leopard had attacked the labourers when they were coming back home through the Abhaipur Reserve Forest of Sonari. The injured labourers were immediately admitted to the Sonari Civil Hospital by some locals. Sonari forest officials suspected that the leopard might have come out from the reserve forest.